When I received the letter from SciQuest last Friday threatening legal action for the allegedly libelous commentary of this blog regarding their company, I immediately shared it with you in my post SciQuest Fights Back: A Case of David and Goliath? In that post, I indicated that I stand by my research and what I have written. That said, and as is my normal practice, I extended an invitation to SciQuest to provide proof that anything I have written is inaccurate or, requires further clarification, and in doing so, I would be more than happy to openly share it with my readers. The reason I made this offer is because I believe that everyone has the right to be heard, and that through such engagement the truth ultimately comes out. This was most recently demonstrated through my radio interview with Bravo Solutions’ Daniel Warn regarding the reported issues with the company’s Ontario Government implementation. Warn’s manner of response – which I believe transcended his words, provided a much needed clarity from which everyone benefited. It also provided you, my readers and listeners, with an additional perspective that will hopefully help you to reach your own conclusions regarding the Bravo implementation in Ontario. Unfortunately, not everyone reacts the same way to my commentary. While a similar interview with SciQuest’s CEO Stephen Wiehe would have been one way to go – this offer by the way is on the table, SciQuest chose to give me a SLAPP. So what is a SLAPP? In this instance, the SciQuest SLAPP came in the form of a 26 page Matter Of An Intended Action document. As soon as I have scanned the document I will make it available to you on line. An intended action document or libel notice, which is required by law, simply means that SciQuest is putting me on notice that they intend to sue me for making- in their opinion, a libelous statement or statements. The purpose of the law is to provide me with the opportunity to review what I have written and to either retract, amend or remove the alleged text. SciQuest of course must identify what they consider to be the libelous or slanderous statement(s), hence the 26 page Matter Of An Intended Action document. An interview would have been easier, but I guess that this route will have to suffice. Just as an aside, this is the first time in all the years that I have been writing this blog that I have been served for my commentaries. By the way, I am not sure if served is the right word because I wasn’t in when, what was described to me as being a kindly gentleman, delivered the document. For most people I would imagine that being on the receiving end of such a document would be a little unsettling. For me it initially was, emphasis on the word initially. However, and as I began to review the contents of the document, any uneasiness quickly evaporated into a sense of ease and confidence. You see when someone comes at you in such an accusatory manner, it is normal to pause and reflect. Part of this process is to read what you have written to make certain that you have dotted your proverbial “I’s” and crossed your “T’s.” In short, was I thorough in my research and fair in my assessment? This is where my sense of ease comes into play. You see, one of the things that SciQuest may have missed is that I have no vested interest in the company’s success or failure. You merely have to consider my comments regarding the Bravo story to see (and hear) that I am interested in one thing, and one thing only . . . getting to the truth. With this as my sole objective, I both dutifully and thoroughly research the subject about which I am writing, providing supporting links to corresponding reference material whenever and wherever possible. Another example of this direction to the reader can also be found in my July 28th, 2015 post What do Ariba and SciQuest have in common? By the way, I found it interesting that SciQuest considered the Ariba post as being libelous? In short, and while I will state my opinion based on my research, years of experience and expertise, I ultimately leave it to you, my readers, to decide the issue. So why do I have a sense of ease and confidence relating to the SciQuest Matter of Intended Action document – for the sake of brevity going forward I will call it the SciQuest SLAPP? Over the coming weeks, as I both share with you and address the company’s claims of libel on a post-by-post, point-by-point basis, the reasons will become evident in terms of my efforts to find the truth. In no particular order, let’s start off with my August 3rd, 2015 post Assessing former CFO Rudy Howard’s departure: Is SciQuest’s Wiehe looking for true leaders or puppets? Putting aside for a moment my perspective based on my experience from the standpoint of having been a President of a publicly traded company on a major exchange or, a two-time Ottawa Finalist for the Ernst & Young Entrepreneur of The Year Award, questions regarding the company’s leadership neither originated with, nor are they confined to, this blog. The following is an image copy of a LinkedIn InMail I received that is self explanatory. 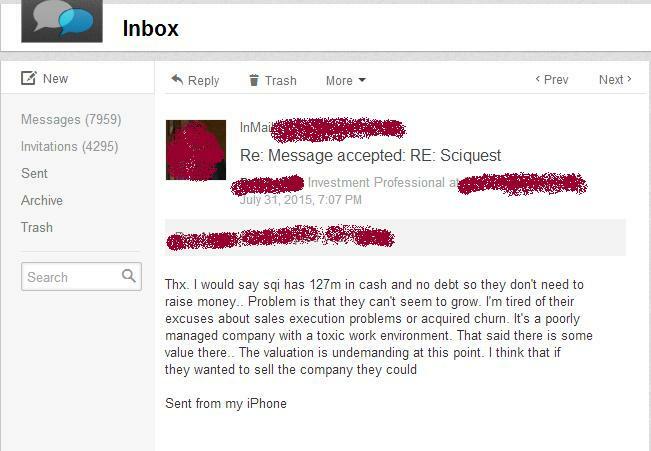 Unsolicited InMail received from a n Investment community professional. While respecting the writer’s request for anonymity, the above represents just one example of the concerns that have been raised regarding both SciQuest’s leadership and work environment. This did not originate within this blog. In other words, individuals such as this came to me offering information – similar to what happened with Ohio and the many other insights I have received regarding SciQuest. Given this person’s background and involvement in the investment community, it is an opinion that I could not ignore. To avoid this post from becoming overly long, I will further address this first point, along with the remaining points of contention relating to the Howard Departure post, in my next installment. You can follow my coverage of this story on Twitter using the hashtag #SQSLAPP. However, and as previously indicated, while I will be providing as part of my point-by-point response the corresponding links and reference material that have already been published, I will also be sharing with you the reference links that I did not publish. For those unfamiliar with the above site, management-change.com publishes reports on capital-market-relevant management changes. The fact that the reader’s comment from the Howard Departure post reports that “An investment adviser asked about Rudy during the Qtr 2 conference call, and Stephen seemed a little thrown. Sounds like Rudy has nothing to do with SciQuest anymore, so you might be able to get some info out of Rudy if you can track him down,” does appear to corroborate the management-change.com assessment. I will of course challenge in similar fashion and with equal zeal, each and every point of contention in the SciQuest SLAPP document in the coming weeks. Again, and as always, I encourage you to review, contemplate and ultimately assess what is being written, and reach your own conclusions. In the meantime, the invitation to SciQuest’s Stephen Wiehe to do a radio interview with me in much the same manner that Bravo Solutions’ VP Dan Warn did, remains (and will remain) open. I for one would truly like to hear and understand his position in an open and honest discussion. After listening to that interview, I will let you be the judge as to whether or not Stephen Wiehe will receive a fair chance to state his position. Editor’s Note: SciQuest SLAPPs Procurement Insights’ Founder and Editor. The risk for SciQuest is that by using a SLAPP, this story could run and run and achieve increasing publicity. I would not have thought that would be Stephen Wiehe’s intention. If he has a legitimate complaint, to accept John’s offer of a radio debate/interview should enable him to put the matter to rest.